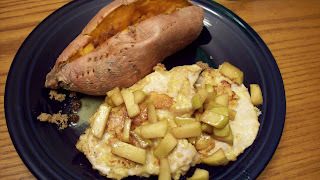 Such a good fall meal and quick and easy for a weeknight dinner. Todd said these were the best pork chops I've ever made! The mustard and apple flavors go together so well. Cut pork chops to about 1/4 inch thick slices. Heat a large skillet over med-high heat with 1 T olive oil. Mix together egg and 1 tsp dijon mustard in a shallow bowl. Combine flour and garlic powder on a plate. Season both sides of pork chops with salt and pepper. Dip each cutlet into egg mixture and then into flour mixture and place in pan. Cook approx. 3 minutes on each side until browned. Meanwhile mix together remaining mustard, vinegar and honey and slowly whisk in olive oil to form a vinegrette. Pour over pork chops and reduce heat to low. Melt butter in a small skillet and add apples and brown sugar. Cook approx. 7-10 minutes until apples are softened and carmelized. 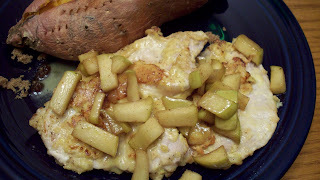 Pour apples over pork chops and serve. I added a side of baked sweet potatos with a little butter and brown sugar for a nice fall meal. Made this tonight for my parents and it was wonderful!! Thanks so much for sharing!